T: To add to Bronwyn’s account, we had a domestic partnership in grad school, probably around 2003. We don’t know the date because it wasn’t emotionally significant to either of us. We registered with the government because Bronwyn worked for the county and they decided to offer health insurance benefits to domestic partners. I was in grad school and needed insurance. We have been through every phase of gay marriage together. Honestly, I’m not sure what the date of the legal wedding was. The legal wedding felt like a triumph and we treated it as a celebration, but our wedding was on October 8, 2000. B: Union of souls, recognition of a partnership, love, wedding dress, flowers, the works (with moderation). T: That’s a complicated question. For me, “marriage” meant a public declaration of our togetherness. It was a “we are doing this.” At the time, it was a somewhat radical declaration. To our families, it felt like dangerous rebellion. Her parents didn’t come; my mother didn’t come. Both said they couldn’t approve for religious reasons. Outside of a ceremony, marriage is the agreement to love each other. In my family, marriages come and go, so I try not to hold it to some magical standard of commitment or some crazy fairy tale. How have you been able to form your own definitions of marriage? B: This one is tough. T: The original definition of marriage I grew up in seemed to be two people who loved each other and wanted to commit to having a family together. It wasn’t until LGBTQ people wanted to marry that the world seemed to really need to specify that it could only be between a man and a woman. Of course, I knew at a young age that loving women wasn’t something the world thought was okay. The marriage thing seems to me to be about love. I love Bronwyn Grant-Nielson. She makes me a better person. Joining together seemed the most natural thing in the world. I guess I formed my own definition by dreaming of marriage with my first love, when I was in high school, and I made it a reality when I proposed to Bronwyn. I made my own definition by never asking anyone their opinion. The only opinion I cared about was Bronwyn’s. By the time we got married, we already knew who disagreed and we didn’t care. Our relationship was a force of its own and it was critical to our happiness. I couldn’t see a life without Bronwyn – for me, that meant it was marriage time. We didn’t ask a single person what they thought or how they would do it. We just did every part of it ourselves. We made it up the marriage ceremony as we were going. We made invitations online and shopped for flowers with my half-mom. Bronwyn bought a dress and made me buy a suit (unnerving because it was the first time I shopped in the fancy part of the men’s section). We did our own vows because the standard ones didn’t fit us; we were never going to obey each other. The wedding wasn’t legal so we didn’t need a church approval and had a good friend do the ceremony. The whole thing really mirrored a traditional wedding. I think the most difficult part was the cake topper because nothing existed back then. We went without a topper and put candles around the cake. It was really a small standard wedding; take out man and put in Toni. What does the term “family” mean to you? T: I agree with Bronwyn. Honestly, family are the people who aren’t going away. I mean live close or live far, born in blood or sharing your home, family doesn’t leave, not really. Family is a bond forged by love, laughter, trauma, and triumph. How were you able to mend your relationships with your family of origin? T: Most of my relationships were fine – no strain. My dad, half-mom, & siblings love Bronwyn. My mom is a lesbian and gay ally. She really speaks up to defend her gay daughter in her Texas community and she has several gay friends. What influenced your decision to have children? B: My work helped catalyst my desire for kids. I had been married to my job for too long and kept putting off the idea or discussion of kids with Toni because of my career. Toni was the one was passionate about having kids. During the federal budget crisis I got demoted at work. It gave me the perfect opportunity to reevaluate my priorities. My number one priority became my family. T: We were always going to have kids, just like we were always going to get married. It’s not a radical concept. “First comes love, then comes marriage, then comes the baby in the baby carriage.” That song was meant for me as much as anyone else. I just knew I would have a family. We spoke about having kids from as early as 19 when we were dating and just dreaming of our future. When it came time to have kids, the universe found a way. B: Responsibility, unconditional love, rewarding, painful, lucky, worth it. I want my kids to have that little edge, more than I had. Laughing, playing, crying, time outs, park play. Small miracles. Always worth it. T:Family is about good fortune. I believe we are very lucky to have built the special little family we have. Getting pregnant can be hard and arrangements with donors or fathers can be difficult. 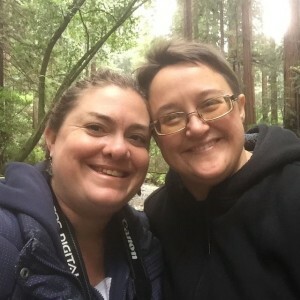 As I meet more and more queer families, I know how unique our arrangement is with a 4 person adult unit all involved in loving our two children. Our arrangement with biodad and his partner could be complicated, but right now it’s not. Right now, it comes easy to all of us. Our children are healthy. Our home arrangement works for all of us right now, so I feel very fortunate. Family is about responsibility. These two little people depend on me to have my act together 24/7. I brought them into the world very intentionally. I feel a deep sense of responsibility to raise happy kids who make the world a better place. Family is about love. My kids love. They help me see love in a way I haven’t seen it in a long time. It’s cool to see things from their eyes. They run to jump on me when I walk through the door. They just love me. They love, love their mommy (not me, I go by the name “bear”). I love them profoundly. I will do whatever it takes to make sure their needs are met. I want to share all the beauty of the world with them. I don’t want to miss any part of their life. They make me see everything differently. I see my own parents and their love differently. I love my parents more as a result of my children. I now truly understand everything they did to love me, and it makes a difference in the mistakes I used to hold against them. They made mistakes, but they love me deeply. I hurt them at times in my life. I imagine my children saying the things I said to my parents as a teenager and the thought makes me tear up. I know this teen part of life is inevitable, but I can understand the heartbreak now. I don’t ever want my children to say they hate me, and I don’t ever want them to think they mean it. I love my parents more than ever.